DHA SUFFA University Opens Admissions 2019 admission test Date and merit list result 2019 Apply online here for admission in DHA SUFFA University. Online search DSU admission schedule and degree programs 2019. Admissions Fall 2019. 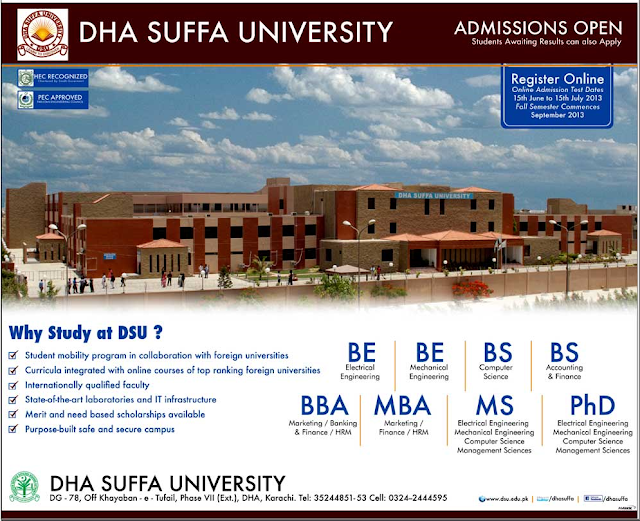 DHA SUFFA University offers admissions in BE in Electrical Engineering & Mechanical Engineering, BS in Computer Science and Accounting & Finance, BBA in Marketing/Finance/ HRM, MS in Electrical Engineering and others & PhD degree programs. Online Admissions Test Dates is from 15th June to 15th July 2013. Item Reviewed: DHA SUFFA University BS/BE/BBA MBA MS PhD Admissions 2019 9 out of 10 based on 10 ratings. 9 user reviews.